Evolve is pretty easy to use program. It helps make playing online games alot easier say cray online for example. It allows you to find matches and communicate better. This is a guide on how to use evolvehq. Evolve is great application with many features, but one of the best features is VPN. Which will let you find opponents easier. Groups. To have a lot of people with same interest in one place. Custom parties. To invite people for a duel. Chat, private chat, and voice chat. Friend lists and many other social features. Open your client and right click on SSA group name and choose "Enter". From there you can discuss and and look for people to duel. Either you can ask for invite to party or create your own. To create party just click "Create Party"
And then invite people by typing in their names, or by right clicking their names in the group chat. People that are in the same party can duel each other. 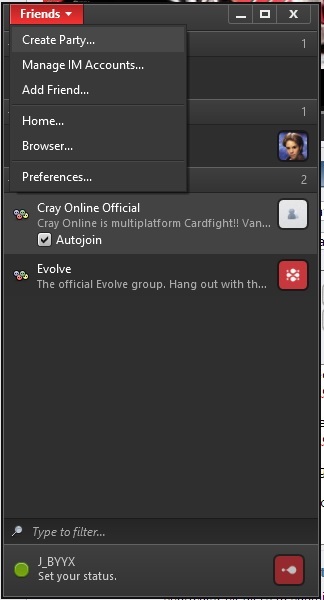 Also most of this guide was taken from cray online foruns so please be sure to stop by there official group and play sometimes.